I had never seen a bison in real life before. I didn’t even know the difference between a bison, a buffalo and the Romanian term “zimbru”. So if you’re in the same boat with me, you’ll understand my newly found fascination with this rare and beautiful creature. To make it clear, it seems that the American bison (“buffalo” in North America) and the European bison ( “zimbru” in Romania) have a common ancestor, that has since become extinct. 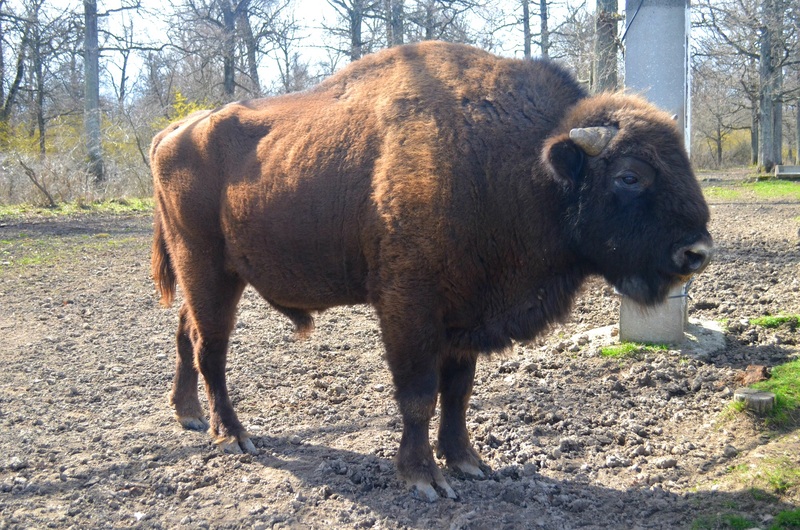 The European bison is bigger, leaner and stronger than its American cousin. 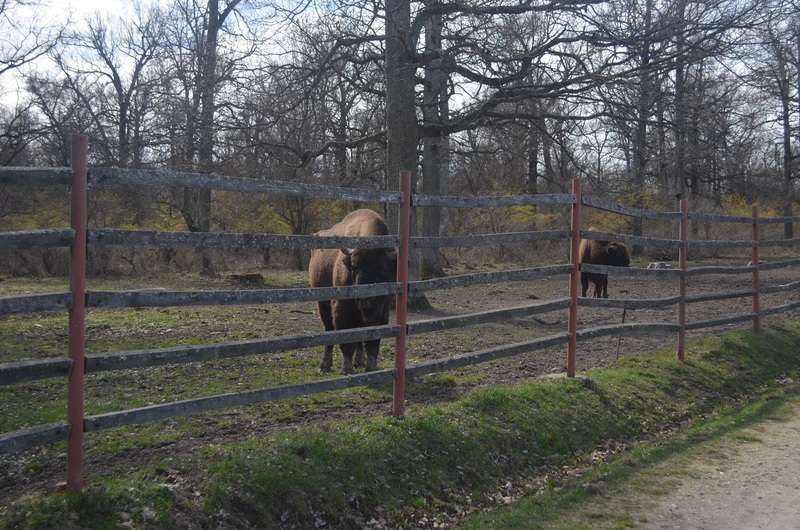 However the buffalo is easier tamed and bred with domestic cows, which makes the European bison or “zimbru” an endangered species. That is why it is already extinct in the wilderness in Romania and other European countries. 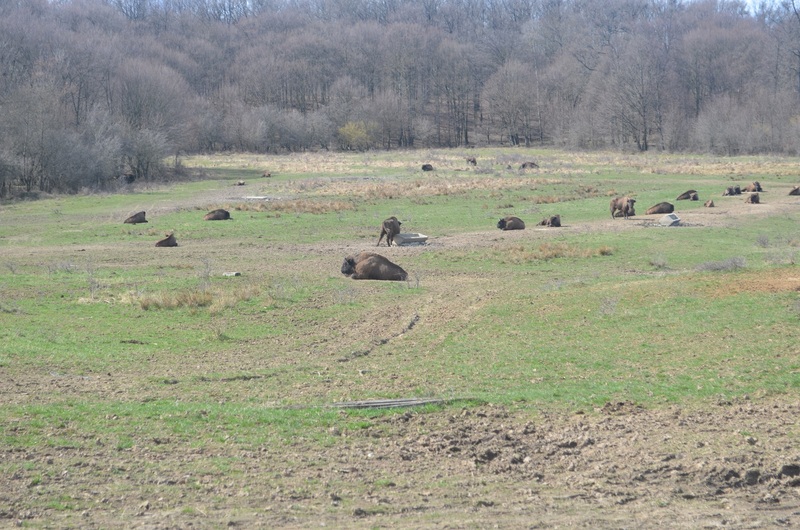 Armed with the only information available online, on a beautiful and crisp spring morning we decided to visit this bison sanctuary. 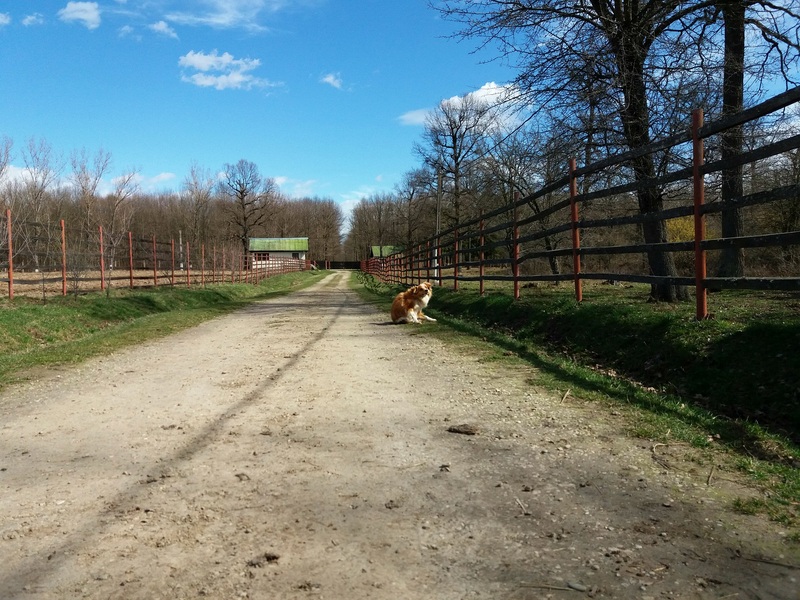 Located not far from Targoviste, it was a two hour drive from Bucharest, Romania (you can find directions here). 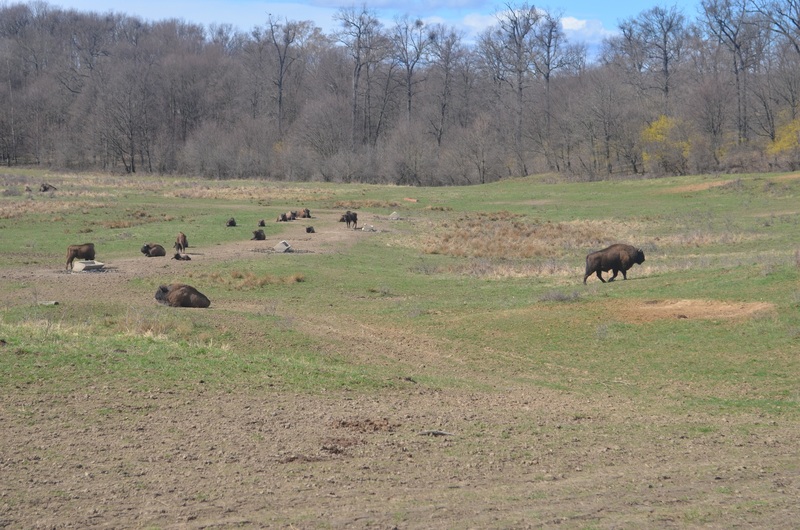 The over 400 acre area (165 hectares) houses over 50 bison. The best time to visit is autumn through spring, though I am not sure how easily accessible the roads are during winter. However, in the summer the bison tend to spend most of the time in the woods, so many visitors don’t get the chance to see them at all. At the entrance we payed a very small fee (less than 1.5 euros per person) and we met one of the workers at the sanctuary, who was also our guide. He let us know we shouldn’t get very close to the bison, they seem gentle but we shouldn’t forget they are after all related to bulls, which can get quite a temper if rubbed the wrong way. We arrived shortly after the feeding time, so we got to see two of the bison at an arm’s length. They were calm and seemed gentle, yet proud and curious. I think they were as curious about us as we were about them. And they seemed especially interested in our cameras and phones that were constantly snapping at them (without using the flashlights, of course). 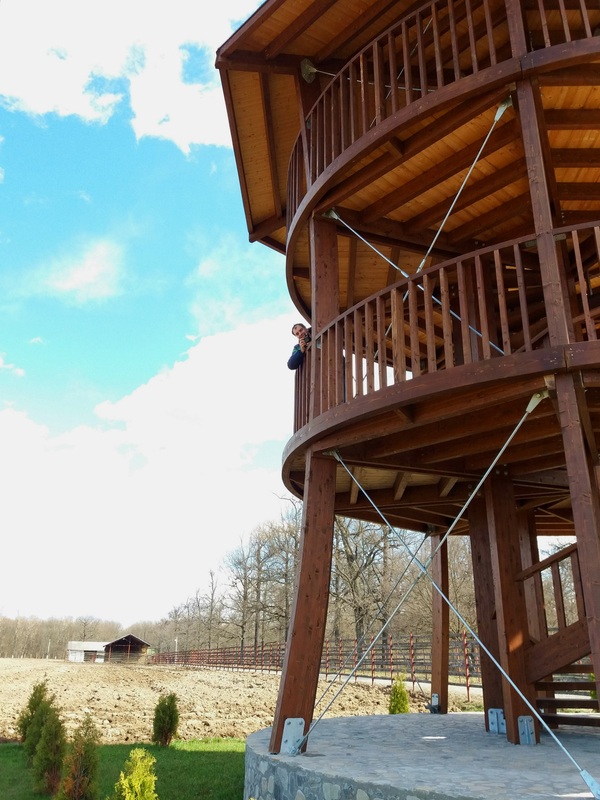 There’s a small road that leads to a gate and a watchtower where you can climb two floors up to have a better view of the grounds inhabited by the bison. It’s only a five minute walk, but you can stay as long as you want and with such views it’s really hard to let go. I spent some time on the last level of the watchtower taking in the views and photographing anything in sight. And I kind of envied the sanctuary employees that get to spend every day surrounded by these views, the peace and quiet and especially by the bison. 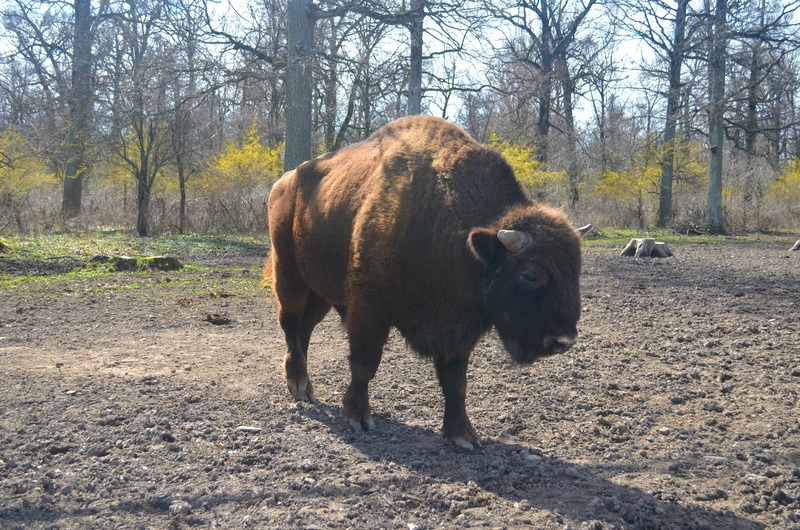 Make sure to visit on a sunny spring day, the views are breathtaking and there’s a better chance of a close encounter with the bison. 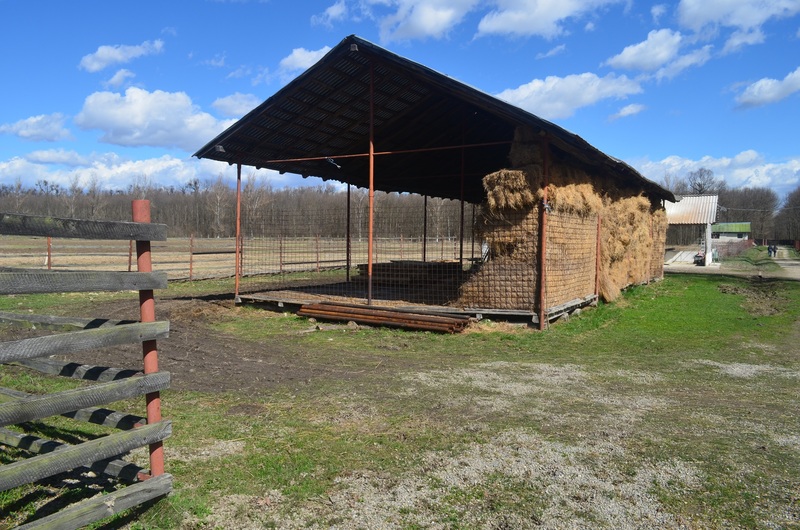 Take advantage of your guide and ask everything you want to know about the sanctuary and the animals it houses; he has a lot of good facts and stories. Bring your camera, it’s not everyday that you get so close to an almost extinct species. Don’t rush! Take in the silence, the views and these beautiful creatures. There’s a taxidermy museum right at the entrance in the sanctuary, but if you are nor particularly interested in this I would go ahead and skip it. The animals exhibited are quite badly preserved so it makes for a rather saddening sight.